Since being founded more than 50 years ago, CAA of Columbiana County has worked to strengthen the community by introducing programs and services that provide financial assistance and services to low-income households and individuals, as well as small businesses. Our mission is to continually find new, innovative ways to drive residents to self-sufficiency and self-reliance. CAA is a private, nonprofit organization and is designated as a 501(c)(3) tax exempt, charitable organization by the Internal Revenue Service. All programs and services are funded by local, state, and federal grants, so they vary based on available funding and support. CAA is the local grantee for the Head Start Preschool Program, our county’s Community Action Rural Transit System (CARTS), and the Home Energy Assistance and Weatherization programs. We also operate Health, Behavioral Health, and Dental Centers at five locations throughout Columbiana County. If you are interested in any of our programs or have questions, please feel free to call us at 330-424-7221 for more information. While campaigning in West Virginia, President John F. Kennedy was faced with the real impacts of poverty. Seeing people struggle even in a time of economic prosperity, he set out to create a federal program that would alleviate the problems of economically depressed areas. After President Kennedy’s assassination, President Lyndon B. Johnson took up the reigns of President Kennedy’s domestic agenda and at his first State of the Union Address in January 1964, declared a War on Poverty. He appointed Sargent Shriver, Kennedy’s brother-in-law, to serve as his special assistant in the war and a task force was formed. The end result was the Economic Opportunity Act, signed into law on August 20, 1964. 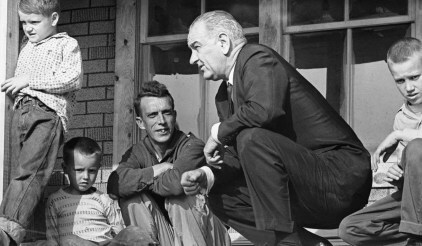 The Economic Opportunity Act established seven titles that developed programs to combat poverty, including the creation of the Community Action Program and several other programs that still exist today. The Act embodied a work-and-training model rather than an income transfer strategy. The goal was not to redistribute tax dollars, but to equip low-income people with the skills to work their way out of poverty. as such, included the concept of “Maximum Feasible Participation” as a core value of the Community Action Program, which meant that low-income people would serve on the boards of Community Action Agencies. This gave a voice to low-income African Americans, particularly in the south, and would cause controversy as the program progressed. The program was also deliberately crafted to allow flexibility for these local, non-profit Community Action Agencies to plan and develop projects tailored to the specific needs of their communities. The Act also established the Office of Economic Opportunity (OEO) to govern the programs under the Act. In May of 1965, the OEO adopted a poverty threshold that would become the federal poverty guidelines used to this day to determine income eligibility for many government programs. The guideline uses a formula developed by Mollie Orshansky, a social science research analyst in the Social Security Administration who took the costs of foods to maintain a minimum diet for a family of three or more as determined by the U.S. Department of Agriculture and multiplied it by three because in 1955 families spent approximately one-third of their after-tax income on food. By 1968, the Office of Economic Opportunity was supporting approximately 1,600 Community Action Agencies, covering 2,300 of the nation’s 3,300 counties. During the early period of the Act, from 1964 to 1967 the number of people rising out of poverty each year more than doubled compared to 1959 to 1964. 2014 marked the 50th Anniversary of the War on Poverty and the creation of Community Action Agencies. Today, the Community Action Agency Network is made up of more than 1,100 local, private, non-profit and public agencies. CAAs provide services to more than 15 million low-income people annually in 99 percent of the nation’s counties. Among them are 4 million children. American Idealist: The Story of Sargent Shriver from Bill Glader & Susan Rohrback on Vimeo.